I was again involved with the Raspberry Pi Birthday Celebrations in Birmingham. This years event was held at the STEMHouse in Birmingham. A makerspace / startup space designed for entrepreneurs and small businesses looking to create a product. There was a strong influence of 3D printing and games programming at the event, including my own talk and hands-on session. During the event I gave a quick talk / demo on a program that I have developed on 3D printing from Minecraft. It’s designed to lower the threshold for those looking to create 3D printed creations. This is work in progress, but allows you to create a platform to design on, and then export it for use in OpenSCAD. More updates will be coming soon with additional features. 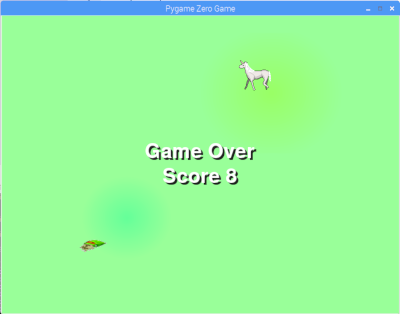 This was a 40 minute practical session on getting started with Pygame Zero. It starts with a very basic pygame zero program, adding a background, some sprites and collision detection. The complete game is where the player controls a unicorn (or other animal) to collect food which appears at random places across the screen. 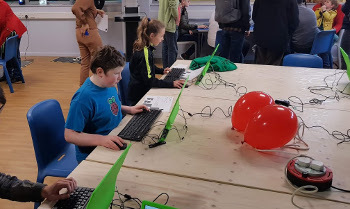 Other activities included talks and practical sessions on 3D printing, a practial Minecraft Python programming session, an introduction to the MicroBit and other talks. The event was mainly attended by families. It was great to see so many young people take an interest in learning computer programming. My own two children attended and were both inspired by the activities. My son with the programming and my daughter with some of the 3D making opportunities. I also hope to give my presentation at the UK 3D printer meetup in Birmingham later this year. In this final part of the design for a 3D printed model railway building I’ve added additional features such as the door, windows and roof as well as adding a smoke generator. These were all designed in TinkerCAD. These are designed in TinkerCAD and then exported for 3D printing. The smoke generator is fitted into the top of the chimney. It is possible to buy smoke generators specifically for buildings, but unfortunately I was not able to find one from any UK suppliers. I therefore used one designed for a OO model railway steam locomotive. This worked, but the amount of smoke is a bit much for a building chimney. You can see the smoke effect in the short video below. Initially I’d separated the main part of the building into two pieces. There was two reasons for this, one was because it made it easier to open up the building to access inside; the other is because of the overhang at the top of the building which means that a lot of additional support is needed during the 3D printing process (the way that the additive 3D printing works means that you cannot create significant overhand without adding temporary support). The main problem this created is that the two parts didn’t fit together quite as well as I hoped. The parts went together, but left a gap between the two parts of the building, especially at the corners. This was partly due to warping of the material at the corners (the corners curling up on the lower layers). I did have the heated bed set to a fairly high temperature (which appears to work better with some PLA and when printing smaller models). The reason I had the bed temperature quite high is that some other PLA I used needed a higher temperature to stick to the print bed, through trial and error I’ve now established that the FiloAlfa PLA actually sticks to the bed quite well at much lower temperatures which reduces the warping. So it maybe that is not be such a big problem with future prints, but joints like that are often visible in some way. With printing the main part of the building as a single object then the print did use a lot of additional scaffold (temporary support) which needed to be removed afterwards, but other than using additional printer filament, which is then discarded, that is not a major issue. Printing as a single object did work better for this, but this is a small building and is almost at the limits for my 3D printer. In future designs it’s likely that I will need to create the building from multiple parts. On my earlier version the fireplace had been a separate part. This is partly because it was added as an afterthough. In the updated version I have included the fireplace and chimney into the main part of the building. I also added a smoke generator, to do this I included a hole in the top of the chimney where the smoke generator could be installed and then a longer hole all the way through the rest of the chimney so that I could run the wires through that. The hole within the 3d printer is not very accurate (at least on my printer), so I had to go through it with a long drill, but it did at least provide the guide for the drill rather than risk breaking the model. The smoke generator that I was able to buy is really designed for a HO/OO model train which fitted into the hole. As the generator is designed for a train it gives out steam in a puffing fashion rather than a continuous stream of smoke as you may expect in a fire in a building. It is possible to buy steam generators that are designed for buildings which would be more realistic, but I am unable to find a supplier that sells them from stock. I hope to order a more realistic smoke generator in future, but for now it does provide a smoke effect. The roof from part 1 is printed as a single piece. The roof is quite thin but needs a lot of scaffold to be removed and once that is removed it is a bit flimsy. In the new version I updated to add wooden roof trusses which provide additional strength and realism. I also made the roof wider with an increased pitch on the inside rather than the outside. This reduced the amount of scaffold (as scaffold is only required when there is around 40% to 60% overhang). I have also added a window frame. This is printed separately using white PLA and fits in from the inside. I have then cut out some 2mm deep perspex sheet (transparent acrylic plastic) to fix to the inside. This is an update on my first outdoor model railway building created using a 3D printer. In the first version of the model railway building I created the building in several different parts, in this version I have decided on just 3. The main part is the body of the building, then the roof and finally the windows. As well as making the building look better this has made is possible to add additional features to the building which will be explained in the final part. 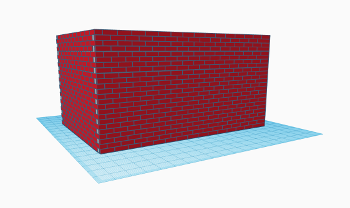 In an earlier video I have made a tutorial on creating a brick wall in TinkerCAD. This worked well, but is very tedious to add each brick manually. I have therefore created this new video which shows how you can partially automate this using code. The code is written using TinkerCAD Codeblocks, which uses a graphical interface to add blocks of code. This is similar to how you would create code in Scratch or an other block based programming language. There is a limitation of 200 objects in Codeblocks, so I had to duplicate the completed object to add more layers. If you have experience of programming then the code should be fairly easy to follow. You can also see how it works by slowing the speed of the code down within TinkerCAD. The next stage is to add the roof and other details, which will be explained in a future video. Please subscribe to the penguintutor YoutTube channel to see future updates. Details of the changes to the latest version are available version 2 of GScale model railway building. Megaquarium is a computer game where you get a design your own aquarium tourist attraction. It’s like Roller Coaster Tycoon, based around a Sea Life Centre. My son wants it as a Christmas present, which is great except in the days of digital downloads a bunch of binary digits doesn’t quite feel the same as giving something they can physically hold. That’s where my 3D printer comes in. I’ve designed a physical 3D version of the virtual game. It includes 3D physical models that can be picked up and moved around and just as in the real (digital) game you can swap which fish are in which tank. The main thing is it provides something physical to actually give as a present, but it’s also functional and I’m sure there are many possibilities for turning into a game by creating some cards or something similar. You can see more details in the video below. 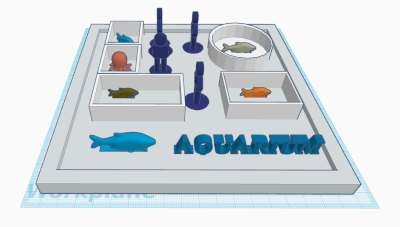 The model is designed in TinkerCAD with credits for the fish, people and the cute octopus linked in the Thingiverse page. I did try and include a seahorse in one version, but it didn’t print very well as such small size and unfortunately the license doesn’t allow sharing the modified model under the creative commons license that I used. The model is printed in PLA, except for the tanks which are printed in transparent PETG. I struggled a bit with the PETG on my printer (stringy and some discoloration of some of the filament) and so transparent PLA may have been better. This year I’ve been creating a 3D model of a building for an outdoor model railway. Technically it’s a building for a weigh bridge rather than a house, but I’ve given it a Santa’s Grotto make-over for Christmas and so Christmas House sounds better. 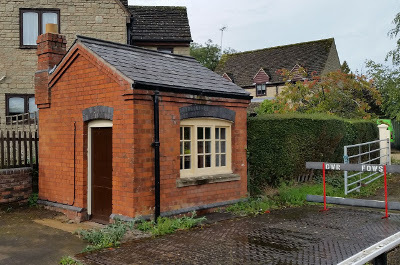 The building is designed in TinkerCAD based on a real building on the Gloucestershire and Warwickshire Railway. 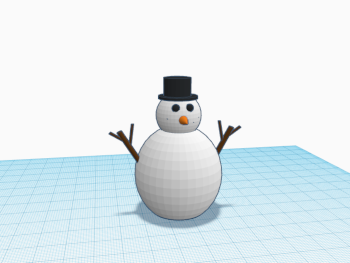 I’ve added a 3D printed snowman also designed in TinkerCAD. Initially I added a smoke generator for the chimney, a white LED for a lamp and a red LED for the glow from the fireplace. To give it it’s Christmas theme I’ve also added a NeoPixel light inside the snowman and string of LEDs as Christmas lights. I have disabled the smoke as that was more appropriate when it’s outdoor with the railway rather than the indoor Christmas display. The circuit diagram is shown below (click on the image for a large version). 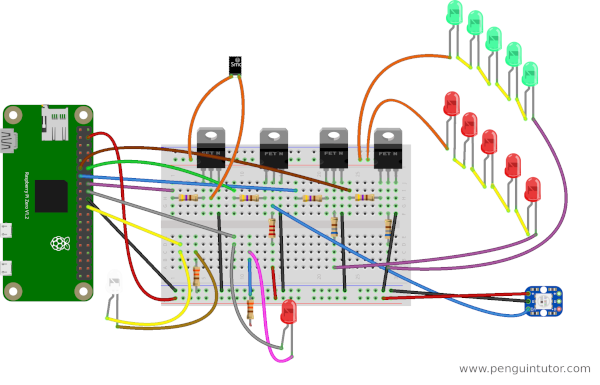 The circuit is designed for a Pi Zero with a custom HAT, which would fit better inside the building, but for the initial version this has been connected to a Raspberry Pi 2 with a half-size breadboard, which just fits inside the 3D printed building. Although built on a bread-board wires need to be soldered to the LEDs. The code works by having a single loop which runs and then pauses for 1/4 of a second. 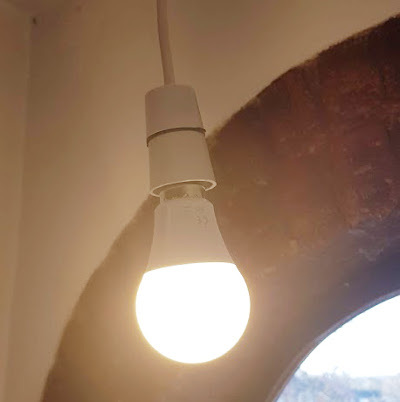 During the led_change function the timer is incremented and if the value of the timer reaches the appropriate factor then it changes which LEDs are on etc. The % provides the modulo value, which is the remainder after dividing the number of the left by the number on the right. Will be exactly zero whenever the value of the timer is a multiple of 12. As the timer value incrementes every quarter of a second this means it updates every 3 seconds. I’ve also created a YouTube video introducing the project. Please subscribe to penguintutor on YouTube. This is a model that I’ve made using TinkerCAD. 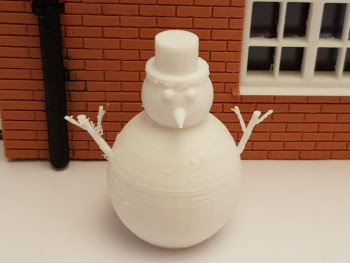 A snowman designed for 3D printing on a home 3D printer. It’s been created to approximate G-Scale (1:22.5) for outdoor model railways. It’s also hollow so that you can insert an LED inside and have it light-up (assuming it’s printed with a light coloured PLA) so it can be used as a light-up Christmas decoration. The photo below show the 3D snowman printed on a Wanahao i3 Duplicator Plus using white PLA. To make it easier to hollow out there is a central cylinder which can be removed. The snowman arms are very delicate at this scale. If the size isn’t important then you may prefer to scale the model up a little which can be done within your Slicer software (eg. Ultimaker Cura). See the PenguinTutor 3D projects page for more 3D models, including more model railway models. There are many different misconceptions about creating model railways and the people that are involved. I’d therefore like to start by dispelling some of these myths and explaining what I think that model railways is about. Many people have come up with different rules for model railways, here’s my take. Okay, so that’s only really 2 rules, but both are just as important. You also need a reason to be spending all that money, so I included fun as a third rule in the description below. This is for your own railway on private land, but if you are on a public display then new rules apply – see Public Display Railways rules. I think it’s fairly obvious why rule number 1 exists, but remember this applies to both the modeling and the display of the model railway. Have you checked there are no exposed live electrical components that could be a danger. For example check the plug is wired correctly and that there is no damage to the mains electrical cable. 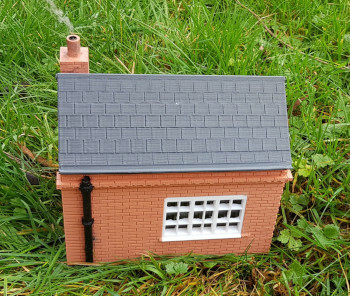 If it’s an outdoor model railway then are all mains electrical parts suitably waterproof or located indoors? 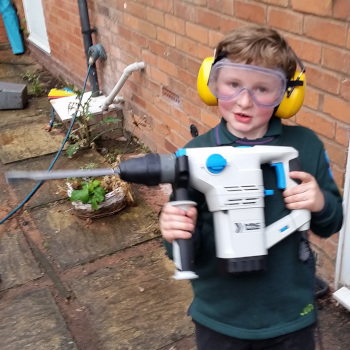 When modeling – do you know how to use the tools, are you following the manufacturer instructions and are you wearing appropriate PPE? When dealing with small models then it’s easy to make the mistake of thinking that the risks are also much smaller, but that is not the case. When using something like a rotary multi-tool / drill then the tools can be be spinning at thousands of revolutions per minute. If a small piece of metal or plastic is thrown out at that speed and hits your eye then it can result in permanent loss of sight. In fact due to the thickness of the cutting blades there is an increased risk of a blade breaking off and hitting you. I know that from experience (fortunately I was wearing eye protection at the time, but it could have been different). If it’s your railway then you can do what you want, which is to say that you make up your own rules of how you want the model railway to look. This is based on you wanting to create a railway for yourself. If you are wanting to participate in a club model or create a model for public exhibition then there may be other rules you need to apply, but when modeling for your own pleasure then you make up your own rules. Why are you creating a model railway. For most of us it’s because it’s something you enjoy (or you want to try it and see if you enjoy it). Which comes back to rule number 2, you decide what the rules are that will make it enjoyable for you. If you can’t afford to buy expensive scale models and want to include some cheap toys in your layout (Playmobil works very well with Garden Gauge Railways), or if you really want to incorporate something but it’s not quite the same scale or a different era then do it. Feel free to do what you want and as long is it makes you happy then it’s the right thing for you. Model railways are good for all ages, from young children to great-grandparents,and ability. It’s also just as much fun for girls, whether the girl is into science and engineering and likes those aspects of building a model railway, whether they are a historian and want to make it historically accurate or they prefer to make some kind of fantasy / science fiction world. There is not reason that model railway should be any less appealing to girls as it is to boys. There is something for everyone. The skills involved in creating a model railway depend upon the type of layout. They could vary from digging the garden and building a brick wall to support an outdoor railway, to painting N Scale model people that are only 1cm tall. There is lots of scope for STEM subjects such as electronics and mechanical engineering; all manner of art from creating scenery items or painting realistic backdrops; and a role for the historian to check on historical accuracy (if that’s the type of layout you want). Most model railway layouts attempt to create an element of realism, but if that’s not your thing you could create a fantasy land with unicorns, sci-fi space planet or a scene from a horror movie, whatever direction your imagination takes you. You may be thinking that you don’t have the space for a model railway, but having seen some space constrained layouts I’m pretty sure that’s not the case. 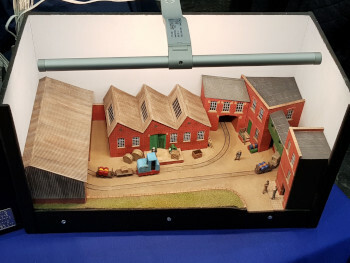 Many OO scale layouts can fit comfortably under a single bed, N gauge is smaller still and I’ve seen an impressive 9mm narrow gauge layout which packed away inside a box smaller than a briefcase. T-scale is smaller still, although the tiny size of those models is a little too small for me (although amazing to see some of the models that some people have made). 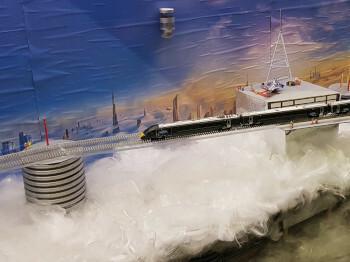 Just take a look at the photo below of one that I saw at the Warley Model Railway show 2018. If you haven’t got space in the house, then how about the garden (if you have one)? It’s a great way to involve the whole family by choosing plants to grow next to the railway. T scale 1:480 3mm This scale is unbelievably tiny. It does look good, but I expect is very difficult to model in. N scale 1:148 9mm This is a common model railway for those looking for a smaller scale for 9mm. It can be particularly useful where you want to model a large layout, but don’t have the space to create it in one of the larger scales. OO scale (Double Oh) 1:76.2 16.5mm The most common scale of model railway used within the UK. 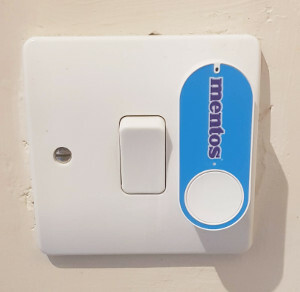 Ideal for use in a loft, garage or under the bed. The track size is the same as HO, but the scale used for models is slightly bigger making it a little out of the proper ration. HO (Half-O) 1:87 16.5mm The most common size of model railway used in continental Europe. Similar to the OO standard and on the same width, but with a more realistic ratio. O Scale 1:45 32mm A scale often used for larger scale models and for some outdoor railways. 16mm Scale 1:19.05 Usualy 32mm * Use for some narrow gauge outdoor model railways in the UK (less popular in Europe). G Scale 1:22.5 45mm * Also known as garden gauge this is a popular scale for modeling narrow gauge railways that can be used outdoors. There is a wide variety of pre-built items available, although often these are based on European or Americal railways. Gauge 1 1:32 45mm Less common than G Scale these are standard gauge trains running on the same 45mm gauge as G scale. Gauge 3 1:22.5 64mm The same scale as G scale, but with wider gauge track for standard gauge trains. Needs a lot of space compared with the other scales listed. 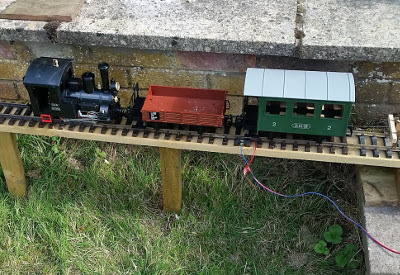 Belos is an example of a narrow gauge – G-Scale railway. This is perhaps one of the most controversial areas: the model railway purists may insist that you shouldn’t include anything that doesn’t comply with the historical accuracy at the time however having made an investment in a particular item then you may be keen to include that regardless of it’s historical accuracy. At the end of the day remember the three rules above. If you want to include it, but it doesn’t fit with the accuracy then it’s your railway and if you are enjoying creating it then it doesn’t matter if it isn’t historically accurate. When buying a model then the chances are that it looks like a pristine brand new version. Weathering is the process of making a model look more realistic by making it look older and dirty. Not everything needs to be weathered as it’s always possible that, if age appropriate, it really is a new locomotive just delivered from the factory. It’s unlikely that all engines and buildings would look brand new. On the other-hand some people may not want to spray dirty black / brown paint over their brand new model. If that’s you then don’t worry, just leave it as it is and accept how it looks. Liability insurance is a requirement for public displays. If you are part of a model railway society check with them as they sometimes provide public liability if you have an “open day” at your own railway at your home. If not then make sure you take out insurance for a public event. One final thing that I feel strongly about is swearing. If you are on a public display there should be no need to use bad language particularly when young children may be listening. This happened to me recently as we visited an outdoor model railway at a preservation railway station. One of the members there was talking with other members and used a completely inappropriate 4-letter word which was clearly audible to my son. Once may be a slip-up but then he repeated the same word again straight afterwards. It’s a word that I certainly wouldn’t ever use whilst with my children and was completely inappropriate. This is my first attempt at creating a proper scale model for 3D printing. In this case I am creating a weigh building in G-Scale. This has been a huge learning curve. I’ve since learned from some of the issues in the first model and so part 2 will improve on the techniques shown. The 3D printed version is approximately in G-Scale (1:22.5 scale). This is also known as garden gauge railway, designed for narrow gauge trains running on 45mm track. It may also work well with 16mm model railways as the size is perhaps a little smaller than G-scale. The main difference between the real building and the scale model is that the model does not use the different coloured brick that is in a curved shape above the window and where the side walls meet the roof. The main reason for this is the time it would take for a feature that I expect few would actually notice if I hadn’t pointed it out. The model was designed in TinkerCAD. In this version I have created the model in several parts. In general this works, but in a later version I will combine the first three into a single model. The reason for this is that there was some warping of the upper part of the building (perhaps due to the bed temperature). Although this is something that I will need to revisit again in future when creating larger buildings. The internal fireplace is something that I added as an afterthought on this model, but will be included directly in the next version. I have created a short video on getting started with TinkerCAD which explains about how to create a simple brick wall. The printer that I have is a Wanhao i3 Plus Duplicator. This is the perfect size for creating this 3D model, which fits fairly comfortably on the build plate. It would not be possible to create a larger building in a single print using this printer. If a larger building is required (as I hope to do in future) then the model will need to be separated in parts and then fastened together. One of the challenges was in finding an appropriate colour PLA to give a good brick effect. The problem with most suppliers is that the closest the provide is either red which tends to be a bright post box red colour, or brown which is too dark. I had tried experimenting with different colours with acrylic paint when creating a brick wall previously, but then I came across a brick effect PLA filament from Filo Alfa. I couldn’t find a UK supplier for the FiloAlfa PLA so I ordered it direct from the manufacturer in Italy. Unfortunately whilst the cost of the PLA is quite reasonable, the additional cost of shipping meant it was in fact very expensive. I am however very happy with the quality of the PLA which works very well in my Wanhao 3D printer. 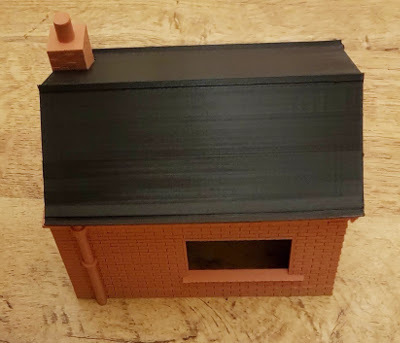 The rest of the building (roof and window frames) is made using my normal 3D printer filament for which I normally use either Prima Value PLA (1kg reels) or Prima Select PLA (750g reels) depending upon the colour availability.